eMpasys industrial Energy Storage Inverters are one of the most advanced DC to AC conversion products in the world and is great for Hybrid projects. Our Energy Storage Inverters main advantages are; high quality sine wave, microcomputer control, stable, multiple power configuration no noise and designed for commercial applications. 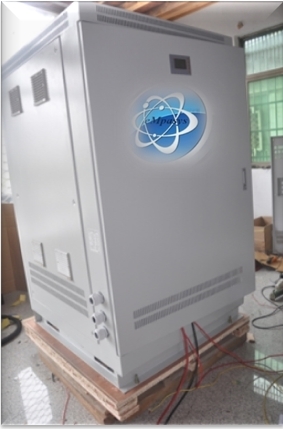 They are suitable for On and off grid energy storage projects. The Energy Storage Inverters output waveform is pure AC sine wave suitable for industrial electronics and home appliances, the power supply features are high quality and better than other solutions on the market. 1, Two kinds of start mode: Reduction Voltage Start and Variable Frequency Start. Clients can set start mode according to the type of the load. 2, The output frequency can be set, this function is very convenient for customer. 3, The output voltage can be set between +20 % to -40 % of rated voltage. It’s a great convenience to users. 4, The DC input voltage range can also be set. Over-voltage point, under-voltage point, over-voltage recovery point, under-voltage recovery point all can be set via the LCD panel. Convenient for increasing or reducing the quantity of batteries, photo-voltaic modules also can be used. 5, Pure sine wave output. with good transient response less than 40MS, little harmonic distortion, higher conversion efficiency and stable output voltage. 6, Powerful data display and fault instruction function. LCD can display the DC input voltage, output frequency, phase voltage, phase current, AC bypass input voltage, output power KWH, time and date, temperature, fault code display. 7, Powerful protection function; the protection for short circuit, over load, over temperature is more safe and reliable. service life 15+ years. 8, Product have passed the European CE (EMC and LVD) certifications also accredited by Australia CEC energy network. 9, Wide input voltage can be set according to your requirement.